Bottomland on the Arrow Lakes from Nakusp to Castlegar provided land companies with an opportunity to cash in on the region’s resource as a productive fruit growing area. European residents keen on becoming independent farmers jumped at the chance to start afresh. Dozens of small points along the lake became settlements; some even large enough to see stores built along with churches and community halls. A great advantage the Arrow Lakes corridor had over the Okanagan farmers at this time was the ability to grow fruit trees without installing irrigation systems. The success of these farms was hindered only by the lack of transportation systems to get the fruit to market due to reliance upon the CPR sternwheelers. To alleviate the crisis, meetings were held. 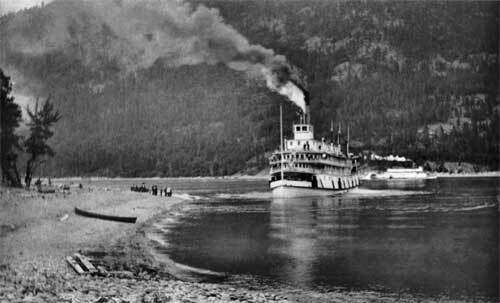 With the opening of the Kettle Valley Railway and the daily boat service cut to a tri-weekly service on October 31, 1915, the small towns below Nakusp that were built up in the orchard boom of 1907-08 became vulnerable to getting their crops shipped out with the new schedule. On March 29th and April 1st of 1916, John Gore, superintendent of the BC Lake & River Service met with fruit growers from the towns between Needles and Nakusp to discuss a new schedule for getting their soft fruits to market. 1) Captain Gore introduced that the company was willing to run an additional boat on alternate days, but did not in any way mean the re-establishment of the daily service. When the berry season ended, the boat would be taken off. 2) FW Jordan advised those present to go ahead and help make this extra boat a paying proposition by finding a market for fruit and shipping it; using the service to its fullest capacity. The more they patronize it, the better it would be for all concerned. 3) The boat would start on about the 20th of June and continue till the end of the berry season. It would carry passengers and be fully staffed like the through regular boat. Only the schedule wouldn’t be the same. The Burton Farmers Institute will be the ones to let the CPR know when to commence this service. 4) The last discussed topic was the routing. Most of the small fruits from Needles south went to points in southern Alberta, McLeod, Lethbridge, Medicine Hat, etc. From Burton north fruits were shipped to Calgary, Edmonton and northern points. The fruit was picked in the morning and shipped by the northbound steamer and reached Calgary in the afternoon. Mr. Smily of Burton stated unless connection was not made at Arrowhead, and suggested that if the boat had to lie over, fruit shipped that day got into the Calgary market for Sunday. 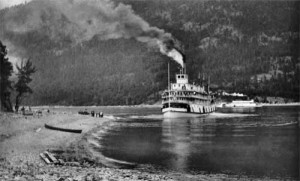 Before the Minto made its first fruit run of the season, the CPR had to renew the service of two steamers on the Arrow Lakes to take care of the delayed passengers from the washed out districts on the main line. To help, the Bonnington and Minto were put in readiness for a special crew from Slocan Lake in charge of Capt. Kirby and left for Arrowhead on June 22nd. The berry run started on Monday, July 3rd, 1916. The first shipments of fruit made weren’t as large as anticipated due to the late cold weather, but the shipment of strawberries on July 7th was double any previous day. In 1917, the second season of the berry boat, the service started a week later with Walter Wright in the wheelhouse of the SS Minto. The season ended July 21st and wasn’t continued in the following years. The onslaught of WWI along with limited production of crops probably led to the discontinuance of the service.